Just The Music is a music player that’s built with an easy to use interface with big buttons that you can easily tap while on the go! It’s great for joggers, in car use or as a compliment to any dock where your controls are easily accessible. Just The Music is also currently the only music player for iPhone and iPod Touch that has a multifunction jog dial! • Multifunction jog dial with variable speed acceleration for fast forward, rewind (scrubbing) or volume control! • Plays locally stored songs, or streams music from SoundCloud! • Song, playlist selection. You can also view and select songs from your currently queued playlist. • Play, pause, back, next, fast forward and rewind (customisable from 1 to 10 seconds). 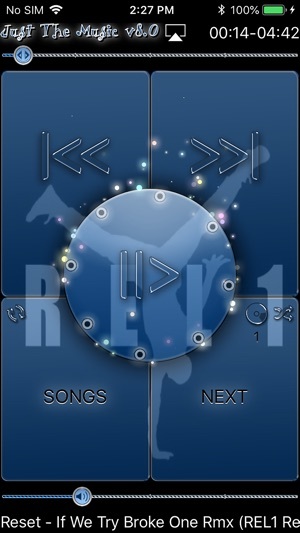 • Shuffle and repeat toggles. 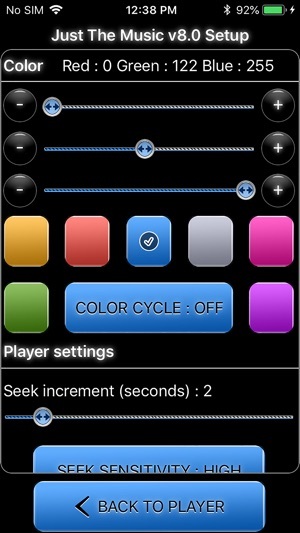 • 7 color themes to choose from. You can also use the RGB sliders to create your own colors, or try the cool color changer! • Song information with album art. • Ability to lookup a songs video on YouTube. 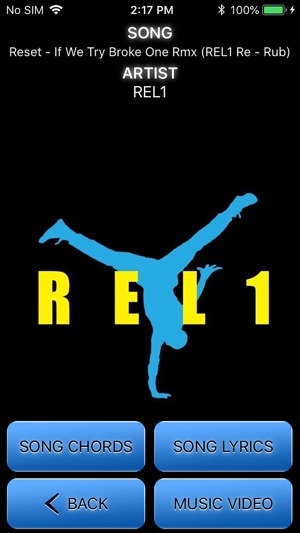 • Ability to lookup a songs lyrics from SongLyrics.com. • Shake gesture support which triggers shuffle, previous or next song. Sensitivity settings are also supported. 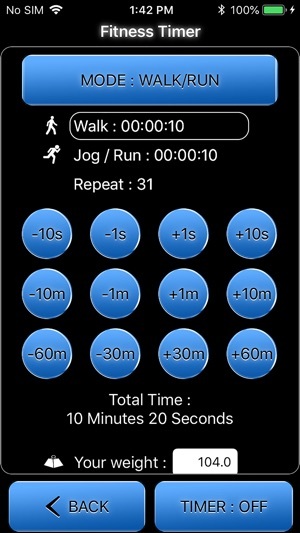 • Fitness Timer calculates steps taken and calories burned based on weight, distance and activity! • Air touch for Just The Music! Now you can trigger play, pause and next without even touching the screen! Wave your hand over the screen to skip to the next song. To play and pause keep your hand near the screen for about a second. Air Touch can also be triggered by "tapping" your body! 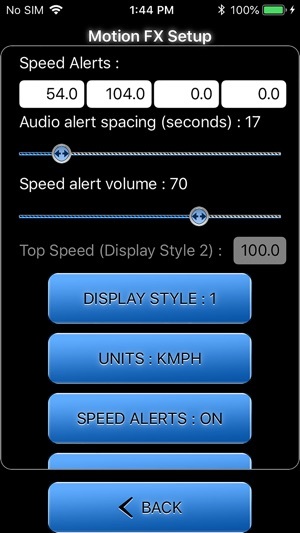 • Motion FX for when your vehicle is on the move! Your current speed is shown and particles are based on vehicle velocity.You can also set optional speed alerts, units of speed are kmph, mph, or knots! • Option to share what you are listening to via sms, email, Twitter or Facebook! • Backup, restore and mirror player settings via iCloud across multiple devices! • A unique and very easy to use interface and more! Please note : continued use of GPS running in the background can dramatically decrease battery life. • save and retrieve player settings from the cloud. 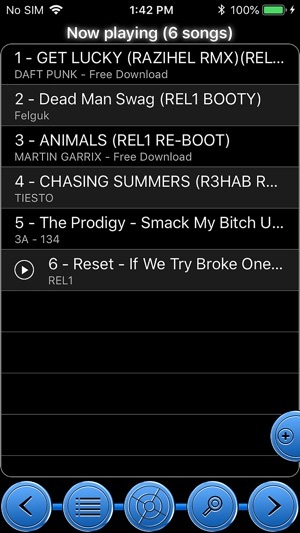 • save and retrieve your favourite songs and Just The Music playlist indexes from the cloud. • faster search response when looking up song lyrics, chords, or music videos. • all restrictions are removed and no ads are displayed. Just The Music Pro subscriptions are renewed monthly. * layout fixes for status bar growth. * screen brightness settings for night based on a defined time range. Getting Very Awesome All The Time!!! Riz Khan, Thanks so much for the most recent updates. 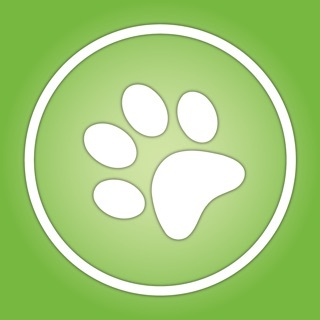 You’ve done so much to make this a very awesome app. The brightness profiles are so great. This app is the only way I will listen to music in my car. I drive a 2010 Kia Soul (Save the hamster jokes*) that had a nice interface with my iPhone (back in the ole 30-pin connector days). But after changing to the lightning connector, I have to control all apps via my iPhone 6 Plus screen. At least With this app and the big button layout along with my really good dock that allows me keep my eyes on the road and my aux cable/charger that allows me to pipe some tunes into voyages. I also really enjoy the speedometer feature (don’t only rely on that for my driving speed). Thanks Again! Keep up the great work. It used to work well. Latest update now tries to load all music when trying to add 1 song to queue, then it crashes out of the app. Why was reversing the sound bar removed from app. That was a nice touch.